Click on a button to go to the section of interest. Cranes require regular inspections in order to maintain compliance with state & federal codes and to keep cranes working safely and properly. Our technicians are certified with Washington State, Federal OSHA Maritime Crane (Longshore and Shipyard), and NCCCO. With over 20 years of experience our accredited technicians help you keep your crane equipment safe and in-service to keep your business booming. 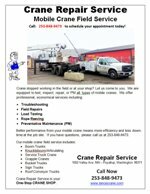 At Crane Repair Service our staff is knowledgeable on a wide variety of cranes and has been trained to detect safety hazards before they become a problem. Annual or Periodic structural & operational inspections are required by WISHA (WAC #296-24) or OSHA (29 CFR, Parts 1915, 1917 and 1918). We supply mobile crane parts for the following and more. Don't see what you need? Call us. Cranes can breakdown at the most inconvenient times. In the middle of picking a load or just when you're about to start a job. No matter where you are, we can help. We can go to you, or you can bring it to us. We repair booms, rebuild cylinders, outriggers, and turrets. We can repair or replace your Anti-Two Block system (A2B), re-run the boom cables, replace your wire rope and all related components. Forward of the PTO through the entire mobile crane, we've got you covered. We are also an ARI, Donlen, and SAM registered vendor.